← Merlot, La Stella Maestoso, Okanagan Valley VQA, BC, 2008, 14.7% abv. 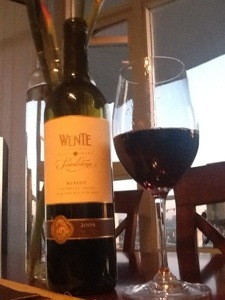 Wente Vineyards, Sandstone, Merlot, Livermore Valley, California, 2009, 13.5% abv. In keeping with the recent Merlot roll I’ve seemingly been on, I opened up another bottle tonight to enjoy on this Labour Day weekend. About a month ago I went to a US wines tasting and this was one of the wines we enjoyed. Livermore is located in the East Bay area close to San Francisco, so perhaps a little warmer than it would be on the coast, but this winery must be doing something right as its been in existence for over 125 years. They claim to be the longest family-run winery in California. This wine is clear, medium minus ruby at the core moving to a wide light pink rim with noticeable legs. On the nose it’s clean, medium intensity, with youthful aromas of red fruit, some herbaceousness, blueberry and vanilla. On the dry palate there’s average acidity, a very light tannin and the medium plus alcohol is a little unbalanced with this. The medium body is enhanced with flavours of blueberry, red fruit (raspberry), some greenness, baking spice and vanilla from the 16 months it spent in wood. The finish is average on this WSET Good wine. Drink now, not intended for aging. This entry was posted in California, Merlot, RED, Red and tagged california, livermore valley, merlot, red wine, wente. Bookmark the permalink.